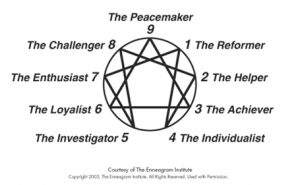 The Enneagram is a psychological type system that has 9 broad personality types. Although it is a very different system from the MBTI, it has all the depth and complexity needed to be useful and effective for describing our similarities, differences and challenges as human beings. The theory of the Enneagram is that each of us is pre-destined to have a sensitivity to a particular basic fear, and that our egos and personalities develop around defending us against this fear. Each of these types is further enhanced by instinctive overlays, a ‘wing’ (some influence from one of the adjacent types), and a developmental aspect. The lines in the Enneagram diagram indicate the types that we may take on aspects on when we are either under pressure or well developed/at ease. In relation to other typologies such as Jungian systems, the Enneagram can be conceptualised as why we do what we do, and Jungian types as how we do what we do. The Enneagram is too complex to deal with in depth here, so this is a very basic introduction to the types. For more information visit www.enneagraminstitute.com or contact one of our members on the register who has knowledge of the Enneagram. There are a variety of type indicator questionnaire options, including a free sample questionnaire available at questionnaire for the Enneagram. Alternatively, look at these brief descriptions of the nine different types and see which one(s) sound most like you. Please note, if you have taken a questionnaire, you may find that you prefer a different description to that suggested by the questionnaire – you are the best judge of your type. Ones are very conscientious people who have a strong sense of what they believe is right and wrong. They tend to have their own code of moral values and attempt to live by this. They see themselves as rational, reasonable and self-disciplined, and value the ideals of truth and justice. They may feel that it is up to them to make improvements and are often willing to make sacrifices for the greater good. They can be afraid of making mistakes and therefore become very controlled and methodical. They try to control their feelings and impulses and can be perfectionistic, self-critical, judgemental of others and may believe that only their views and opinions are correct. Twos are sincere, warm, encouraging, empathic and full of feelings of care and warmth towards others. They are concerned about the needs of others and may go out of their way to help others. They are thoughtful, generous, helpful and people pleasing, and they seek close and intimate relationships with others. They may, however, become over-friendly and possessive over those they care about. Twos tend to feel that it is selfish to state their own needs, yet they have a strong need to be liked and reassured by others. This can lead to martyr behaviour and a dependency on positive attention from others to make them feel accepted. Threes are self-assured, have high self-esteem and believe in their own value. They are energetic, ambitious and adaptable, and often seen as charming and popular by others. They seek self improvement and tangible achievements. They attempt to be the best at what they do and are motivated by status and prestige. They can often seek recognition from others and this can lead to them becoming image-conscious, competitive, results focused and achievement oriented. They often put their feelings aside in order to allow them to adapt to the expectations of those they see as important. Fours are very in touch with their feelings, are introspective, self aware, sensitive, intuitive and authentic. They are compassionate and respectful towards others, although they enjoy spending a lot of time alone. They enjoy beauty and aesthetically pleasing things and are often artistic, romantic and imaginative. They value individualism and may try to express their individuality through artistic or creative means. They can get over identified with their feelings and have the tendency to take everything personally, becoming hypersensitive, temperamental and dramatic. Fours also have the tendency to slip into melancholic, self pitying fantasies and obsessing about negative emotions. Fives are mentally alert, curious, observant, insightful, innovative, imaginative and inventive. They enjoy seeking knowledge, are independent thinkers and often become experts in specific subjects. Fives like to conceptualise and think about everything before acting, and therefore may withdraw from the world to do this. They can often become preoccupied with their mental visions and interpretations of things rather than with reality. There is also a tendency for fives to become over identified with thinking at the expense of consideration for emotions or physical matters. They can also be cynical, and some fives are fascinated by subjects that others consider to be dark or disturbing. Sixes are friendly, engaging and playful, and others often have feelings of warmth towards them. They are reliable, dependable, hardworking and trustworthy, and will follow through with their commitments. Family and friends are very important to sixes and they will be committed and loyal to those who are important to them. They want to be liked by others and approved of. They are practical and self-disciplined and may come across as cautious. Sixes can become self-doubting and may look to others and authority figures for guidance and support. They can become anxious about the unknown and try to manage this by careful organising and planning. If they feel their security is threatened they may become stubborn, reactionary, aggressive and short tempered. Sevens are free-spirited, enthusiastic, responsive, spontaneous, adventurous, vivacious, lively and stimulating. They enjoy experiencing the world and are very drawn to sensations and experiences. They seek variety and are versatile and adaptable to many situations. Sevens can, however, become easily bored, reluctant to take on commitment for fear of missing out on other opportunities, hyperactive, scattered, distracted, outspoken and uninhibited. They fear being trapped and want to maintain freedom and happiness. They tend to look at the positives in everything, but sometimes to the extent that they will block out or deny any negative realities. Eights are assertive, self-confident, action-oriented, tenacious, robust, independent, direct, decisive and authoritative. They stand up for themselves and come across as strong and resilient people. They have a can-do attitude and an inner drive, and will enjoy taking on a challenge or taking the initiative in situations. They seek justice and fairness and seek to protect their independence and have control over their environments. However, eights can often become competitive, boastful, dominant, forceful, bossy and confrontational. They may also become emotionally defended and refuse to show their softer feelings in order to appear invulnerable to others. Nines are gentle, kind, optimistic, reassuring, supportive, stable, serene, accepting and trusting. They come across as easy-going and unpretentious, and often have a calming effect on others. They endeavour to bring people together and often make good mediators and counsellors. However, nines can become fearful of conflict or disharmony and may therefore resist any change or pressure, resulting in them becoming complacent, unresponsive, procrastinating and ‘numbing out’. They may also become self-effacing and try to sweep problems and their own needs under the carpet. In their relationships with significant others, they may seek to maintain good relationships but with a ‘protective barrier’ in place to avoid letting others get too close to them and potentially hurt them.